Boys *- Boys' Score Sheet, rev. 2017. In use for 2018/2019 season. Coach Code of Conduct *- Signed copy required from all Coaches, every year. 2019 LOANER GEAR RENTAL FORM *- Please fill out this form, initial and sign, then please scan and email the filled out form to gear@berkeleylacrosse.org. You may pay by check or credit card. Mail check (payable to BLC) to: Berkeley Lacrosse Club Call Miriam at (510) 809-6394 to run your credit card via Square. 2019 Parent Info Presentation *- Presentation given January 23, 2019 with lots of important information about the 2019 Spring Season. Please contact info@berkeleylacrosse.org with any questions. Gear Replacement Costs- If you do not return your gear, or do not return it in wearable condition, i.e. missing straps, snaps, ties or in other state of non-wearable disrepair, replacement costs are as follows. 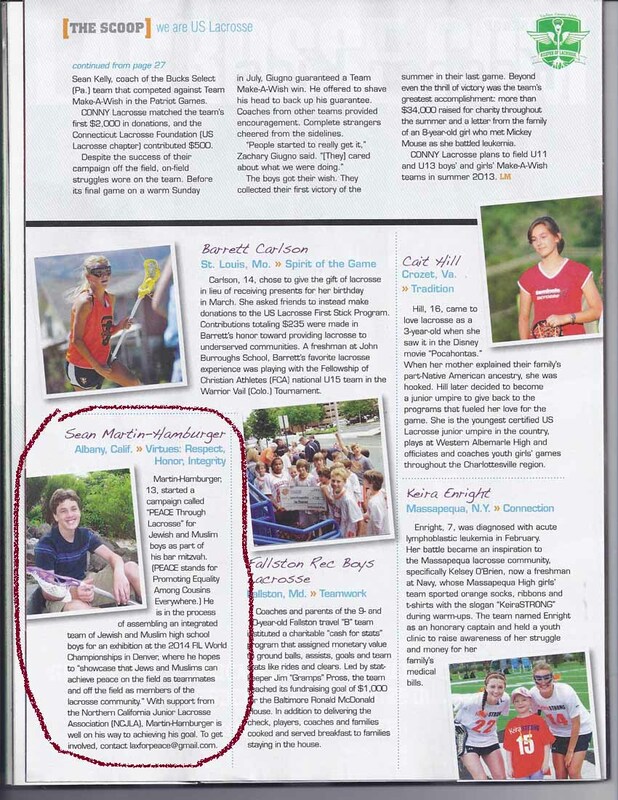 S. Martin-Hamburger US Lax- Sean Martin-Hamburger's writeup in Lacrosse Magazine for his Team P.E.A.C.E project. October 2012 Issue.